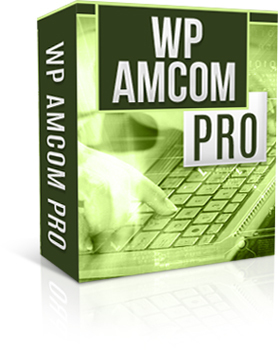 "Here's An Easy Way To Make More Money From Your WordPress Blogs, By Adding Self-Updating Amazon Bestseller Ads To Your Blog Posts"
If you're looking for an easy way to increase the profits from your blogs, you'll be very interested in our new WP Amcom Pro software. This easy to use software inserts ads at the end of your blogs posts, showing a selection of the latest bestselling Amazon products relating to your niche. These ads update automatically every day, so your blog always shows the very latest bestselling products for your niche. And all the ads include your Amazon affiliate ID, so you earn commissions on any resulting sales - giving your blog an instant profit boost. The software uses the Amazon bestseller "RSS feeds" to get the latest ads. These provide a self-updating selection of the bestsellers in any Amazon category. Although these feeds have similar benefits to conventional Amazon ad units, RSS feeds are very different from the search engine perspective. Conventional ad units cannot be read by search engines. In fact they appear to the search engines as a "hole" in the page. In contrast, RSS feed content actually becomes part of your blog pages - and appear as normal content to the search engines, helping to make your pages appear unique. Simply go to the Bestsellers section on the Amazon site and find the category you want, then click on the "RSS" logo shown on the page. Copy the web address to your Windows Clipboard and paste it into the tool, then enter your Amazon affiliate ID. When you have entered your details, the software will create a Wordpress plugin. The plugin can automatically append the Amazon content to the end of every post, or just append it to the first post shown on each page. Alternatively, you can add the content to specific posts/pages. Once the plugin is activated, you'll earn commissions on any resulting sales on autopilot. Amazon RSS feeds are based on the best selling products from your chosen Amazon category (in the example blog, the category selected is "cooking/food"). The ads are automatically updated as the bestseller rankings change each day. The plugin incorporates "caching" technology to ensure that the RSS feed does not slow down your web pages. The content is read and processed from the RSS feed source once a day (or other period specified by you). This means there is very little overhead on your web server from using the plugin - and your blog should load just as quickly as normal. The software includes our special Theme and Plugin Installer Tools. Requirements: Blogs must be WordPress blogs on your own web hosting (i.e. NOT on wordpress.com). Ideally you should be using the latest version of Wordpress, but the plugins should work with any version of WordPress from 2.6 onwards. The tools that create the plugins require a PC running Microsoft Windows (any version). Amazon.com only: The software is designed for use with amazon.com only - not other Amazon sites. Earnings Disclaimer: Although Amazon ads can be an effective form of income generation, the results are dependent on many factors outside our control, including the blog content, blog design and number of visitors. We are not therefore able to give any guarantees about the income that you will attain by using this software.